Surely you’ve experienced this: You and your little one are out and about, home is only ½ hour away but she insists loudly on her bottle of milk – NOW! A “milk-down” like that is something you want to avoid. So much that it sometimes even controls how you plan your day. You see to it, that you leave home just after your baby has been fed. And you make sure that you are home before the next bottle of milk is due. This is exactly why we invented the self-heating baby bottle, iiamo go. 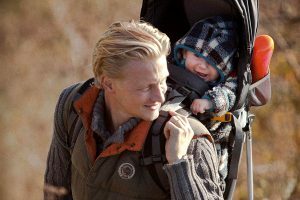 We love outdoor activities – and of course we want to bring our babies too. What we don’t want though, is to worry about where or how to warm the next bottle of milk. iiamo go opens up to that world of less planning and more adventures. Off you go! Don’t forget your iiamo go baby bottle and a few disposable iiamo warm heating cartridges. Your little one is hungry? Just insert an iiamo warm heating cartridge into the heating chamber of your bottle. Then turn the trigger all the way and shake the bottle to activate the heating function. Wait 4 minutes; occasionally shaking gently to make sure the heat is distributed evenly in the milk. Don’t forget to check the temperature before feeding your baby. Now your warmed feed is ready! For this idea iiamo go was awarded with several awards. Warm a baby bottle – anywhere! It was never easier for you and your baby to enjoy a whole day together outside. You’ll see. Where would you go first: to the zoo, on a hike or with the bus to visit your best friend? We’ve been told that the self-heating functionality is also highly appreciated in the middle of the night. You can feed without leaving your bed if you just really, really need the rest. Good to know: iiamo go comes with an extra flat bottom. This turns it into a conventional feeding bottle. Use it at home or whenever you don’t need the self-warming function. By the way, we are proud to say that Karim Rashid has designed all iiamo products. He’s a father himself. He’s also a renown industry designer, who has worked for major brands like Prada, Sony and Armani. and the drinking spout, iiamo drink. This turns your baby bottle into drinking bottle for sports or kindergarten. an iiamo drink drinking spout. Now your baby bottle can live a long, happy life as drinking bottle.